Ooooh No! Not a playfair! That was this Numpty’s reaction but the other one said “There’s nothing to them – let’s just solve and see what is going on.” And solve we did, at a terrific speed. Mordred gave us some very straight-forward clues and we really like that. 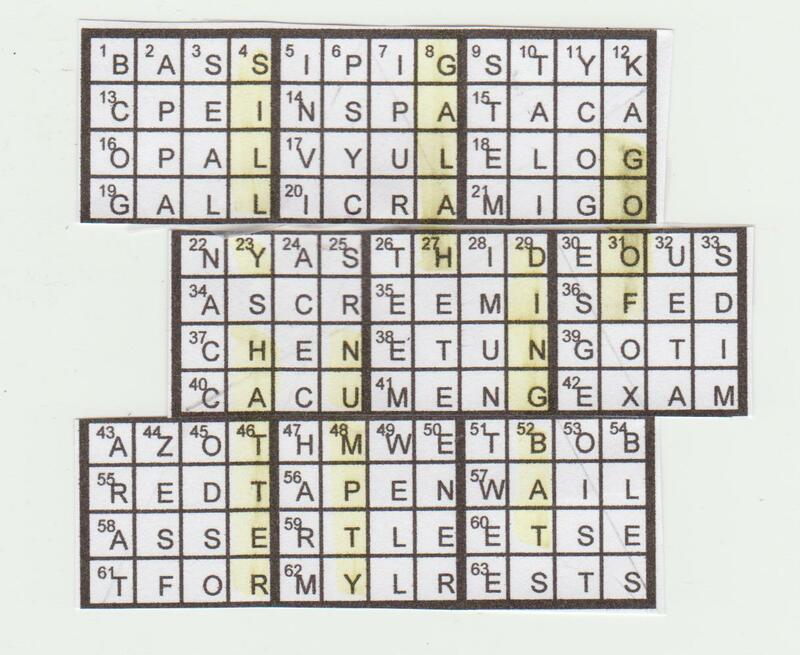 No extra letters, misprints or quaint messages to extract from frantic Listener hoop-jumping – just clues! Wow! We enjoyed some of them: ‘Buffalo Bill tours America drawing (6)’ FUSAIN fitted the letters we already had in place so we had to work out what FIN had to do with ‘Buffalo Bill’. Of course the BRB told us that a FIN is a five-dollar bill – great clue! We learned a few new words too: LASSU, SPOD, SPAWL and SNOOLED, but we couldn’t find any hint of membership of the Listener setters’ topers club. Mordred seemed to be setting an example of sobriety. 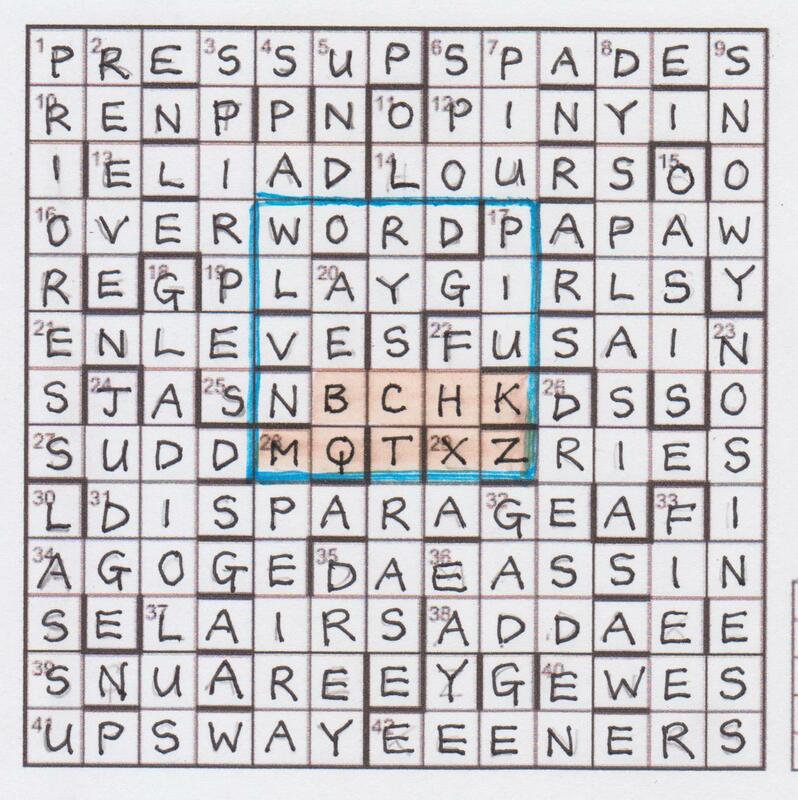 We once met an ex Brain of Britain who obliged himself to solve crossword clues in the given order and to do the entire Grauniad or Times crossword in his head (while we were still puzzling over 1 across). Our progress, for once, was rather like that and we worked from top to bottom, completing the grid, gleefully, in record time, but with a fearful sense of foreboding. We had, however, along the way noticed WORD PLAY appearing in the grid. (Clearly Mordred is resolving that issue – for him it is two words!) From the preamble, it was clear that we had to have nine letters left over after we spotted our ‘playfair code phrase’, so it had to have sixteen letters (to make the 25 of the 5 X 5 square). WORD PLAY GIVES FUN seemed promising and no letter appeared more than once in the sentence. We worked out that that would leave us the letters B C H K M Q T X and Z (assuming, of course, that J and I cancelled each other out). 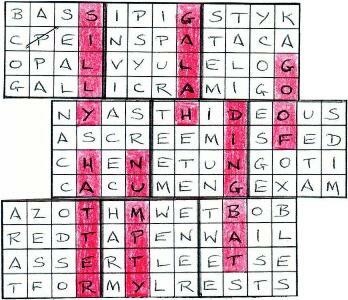 It remained to check that each of those letters appeared only once in the remainder of the grid and Eureka! We seemed to be doing what was required but are still profoundly worried that we have missed the final point and that the grid should have yielded real words. However, it was clearly no mean feat to compile a grid with each of those letters appearing once and once only, so perhaps it was too much to expect real words. Thank you, Mordred. You have given us confidence in our grid-filling ability and we’ll learn in three weeks’ time if we have missed a subtle final move. A strange title, I thought. After all, it’s not as though we’ve had three of the pesky things in the last couple of months! You can probably guess from that sentence that Playfairs aren’t my favourite device. Luckily, the first part of the preamble indicated that we didn’t actually have to do any encoding, but just find a Playfair code-square in the grid. I wondered, therefore, why the remaining two-thirds of the preamble was devoted to explaining the coding method in detail if it wasn’t to be required. It was an enjoyable solve, with some nice surface readings, particularly the obliging Scottish landowners dropping dead in their burial plots (LAIRS). We also had Lady Penelope’s butler at 23dn — Parker perhaps displays such lack of vices, securing regular parts in Thuderbirds — where NO SINS contained just the 6th and 12th letters of thundErbirdS. I spent longer than I should have done in unravelling three clues. 13ac Girl with duke slipped a wink to Will (5) was obviously ELIAD, but it was some time before I saw that it was just DELIA with the D slipping to the end. 14ac Times when computer program fails both of us (5) was BOTH – BOT (computer program) + OURS (of us) giving HOURS (times). 19ac Three Sisters could be more than one dedicated to pleasure (9) I thought was going to be PLAYBILLS rather than PLAYGIRLS. 36ac Intricate puzzle using A-Z set by Mordred (4) giving MAZE was a gem. 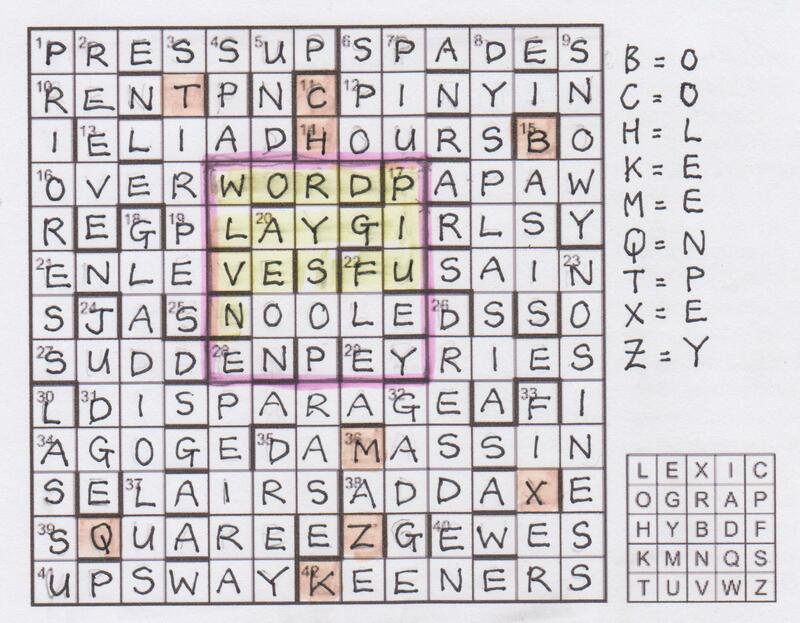 With the grid finished, it didn’t take long to find the code-square, but it took a bit longer to make sure that I correctly swapped the nine letters not in the code phrase WORDPLAY GIVES FUN. Taken at face value, you could be forgiven for thinking that the setter’s task was just a question of fitting the Playfair code-square in the centre of the grid. But Mordred had set himself a fairly stiff additional challenge. The nine letters not in the code phrase weren’t to be found in the code-square after the initial gridfill. They were scattered elsewhere and had to be swapped with those currently sitting in the code-square. Thus, there could only be one each of B, C, H, K, M, Q, T, X and Z. Making sure that there was only one T must have been a real swine! So thanks to Mordred for an entertaining puzzle that didn’t involve deducing the codeword from encoded entries. Unlike Rustic’s EV puzzle the following day which it was my turn to blog for fifteensquared!! ‘Oh dear’, was the first Numpty reaction. The preamble for Ron’s X and Y was almost as large as the grid and, as we read through it and coloured our pages accordingly, we found ourselves making a column for extra letters, a column for extra words and little pink squares to remind ourselves that the down clues were in alphabetical order of solutions. It got worse when we came to that word ‘dodecagon’ – more of that later! Even though some of the extra words stood out rather obviously (ECTOCRINE/ NEURATION/ TE-HEED), we didn’t exactly cover ourselves with glory as far as finding the quotation was concerned. We had solved for about three hours before ‘to pretend that they came round the corner’ prompted us that we were on familiar ground – and we are great Winnie the Pooh fans. 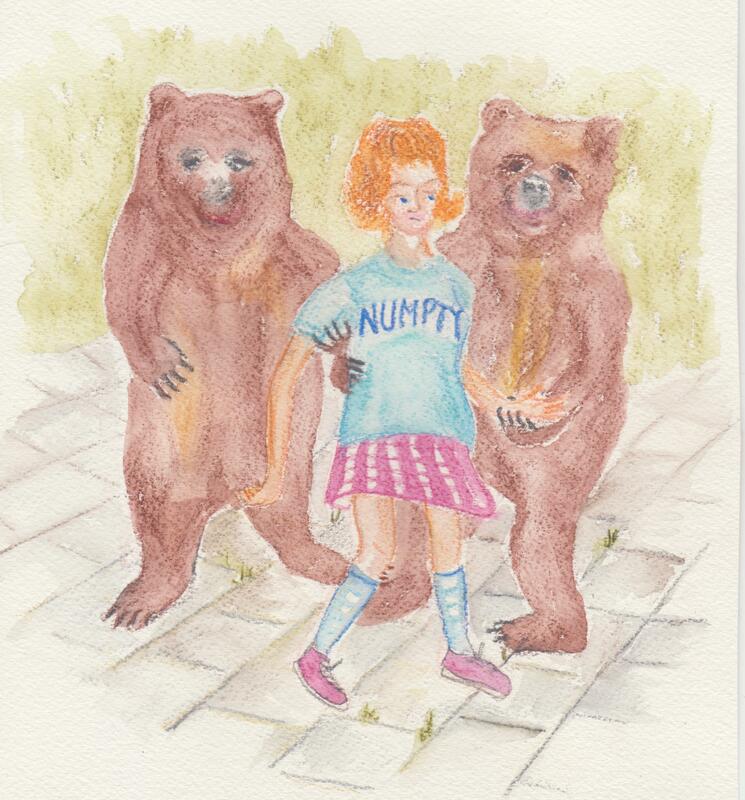 For years, when I was small, I walked ‘never on the cracks and only on the squares, to avoid being eaten by the bears‘. ‘And some of the bigger bears try to pretend that they came round the corner to look for a friend’ was prompting us that the puzzles theme was lines and squares (X and Y). Of course, all those little bears were waiting to gobble up any sillies who stepped on the lines. Now that we could tease out the extra letters, we had the message 4X (lines) 9Y (squares) CUT TWICE ALIGN SILLIES. 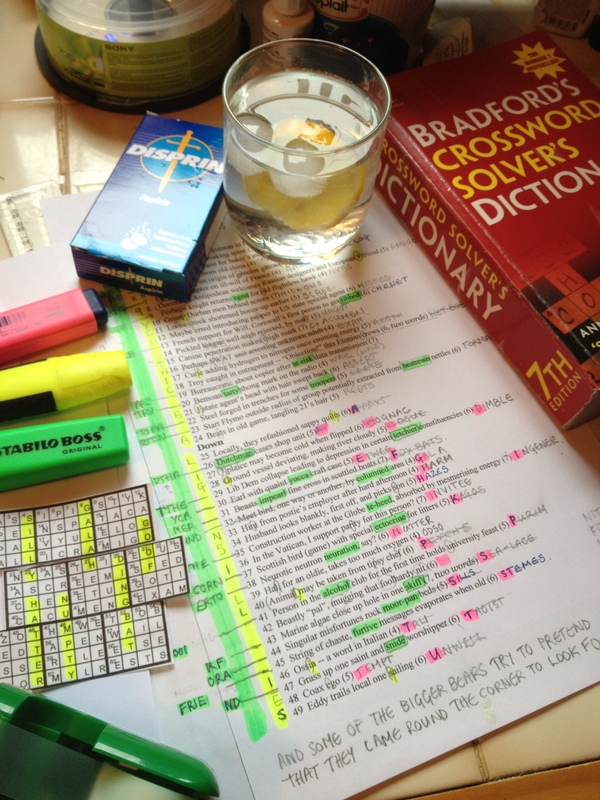 I had used Antony Lewis’ Crossword Compiler to construct my grid and wonder how anyone manages with just pencil and paper. The statement that ‘the initial bar pattern has 90-degree symmetry’ was a gift, as it gave us so many of the words from the lower half that were proving very difficult to solve. (UNGOT – ‘Pickled tongue well-nigh rejected by mat? (5)’ TONGU[e]* – Rejected by ma[t] and CACUMEN ‘Canine penetration makes thigh mark ((7) – [t]high mark C + ACUMEN. Of course, we had noticed that Ron solidly earns his place in the Listener Setters’ Tipsy Club (well we saw him in the Ring o’ Bells before the Listener setters’ dinner just a couple of weeks ago so needed no confirmation, “Cheers, Ron!”). ‘Loose crock shortened booze up earlier’, ‘Animal may be taken from tipsy chef’, ‘Person in the alcohol club for the first time holds university feast’ he tells us (SCREE, PSYCHE and PURIM). 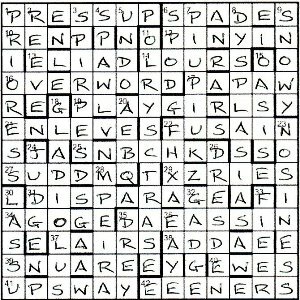 There were two bars in every column and in every row so even a Numpty could see how these should be moved to create four lines and nine squares, and even a Numpty could see that there were potential words for sillies in the complete grid. ‘Beastly pal mugging that foolhardy nit’ was our extra clue and had to produce six sillies, and, sure enough, there they were. SILLY, HATTER, GALAH, DINGBAT, GOOF and, surely not – fame at last! NUMPTY. But how numptyish can we be? I had a very clear (and flawed) mental perception of what a dodecagon should be (a twelve-sided figure with twelve angles – I was visualising a regular one, and any numpty could tell you that was not possible here) and attempted to draw diagonal lines on my grid with increasing frustration, finally abandoning in despair and sleeping on it. Many thanks, Ron, this was a super puzzle with so much in it. It was 7pm Friday evening, a time when many Listener solvers were putting the finishing touches to their submission of the puzzle that had appeared online only a couple of hours or so earlier. I, on the other hand, was frantically looking for my notes so that I could write my Listen With Others blog for the previous week’s puzzle, X and Y by Ron. Try as I might, the exercise book that contained the notes eluded me. There was only one thing to do … go down the pub. The Crown was fairly empty, but Mark Bull was sitting in a corner drinking a pint of bitter and finishing off a bowl of salted peanuts. Two empty crisp packets showed that it wasn’t his first snack of the evening, and I was sure it wasn’t his first pint. Although he was tolerable in a group, one-to-one he could be a bit overbearing, and I wasn’t really in the mood for Mark that evening. However, before I could slip out the way I’d come, he spotted me and called me over. He asked me what I was doing in The Crown on a Friday, the Swan Uppers being my Friday pub of choice, and then later at about 9. I explained the problem with my missing notes on Ron’s puzzle. Mark was also a Listener addict, but I hadn’t told him about my involvement with Listen With Others. As far as he was concerned, they were just comments to a novice solver who had asked for my help in becoming better at the Listener. I also avoided him like the plague while there was an ‘active’ puzzle that I hadn’t finished as he was liable to blurt out comments on the clues or, worse, the endgame! “That puzzle was a doddle”, he said, polishing off the last of the peanuts. “Tell you what, buy me a pint and I’ll do the notes for you.” Despite my protestations, he shooed me towards the bar, and, as I looked over my shoulder, I saw empty crisp packets and the peanut bowl being swept aside and a scruffy piece of paper and pencil pulled from his jacket pocket. Suddenly, there before me Mark started morphing into the character from the Star Wars films, Jabba the Hut. It reminded me of the fabulous Hideous Hog from Victor Mollo’s excellent bridge books such as Bridge in the Menagerie. I shuddered, and Mark returned to his former shape. When I returned from the bar with our drinks, Mark shoved a piece of paper under my nose. It had a list of points in what can only be described as kiddies’ scrawl! His name was in large letters at the bottom. “There you are. How everyone should have solved the puzzle. Let me know what your protégé thinks, and keep my name at the bottom.” Mark left a short while later without buying me a drink in return, and I was able to relax at last … before going down the Swan Uppers. Unfortunately, despite looking high and low for my notes the following week, I couldn’t find them. So here is the scrawl provided by Mark. Whether it ties in with the way you solved the puzzle, only you can tell. Fit them in the grid with the bars. Begrudgingly congratulate the setter on the thematic nature of the ‘false’ clue (42): Beastly “pal”, mugging that foolhardy nit (6). Check your favourite book of quotations and determine (if you didn’t already know) that it came from When We Were Very Young ‘Lines and Squares’ by AA Milne. Make the association between the theme of the puzzle, ie the poem ‘Lines and Squares’, and the title, X and Y: ie X = Lines and Y = Squares. 4 X 9 Y, cut twice, align sillies. Understand that the phrase ‘by titular reference’ meant that X had to be replaced by ‘Lines’ and Y by ‘Squares’ so that the resulting grid was divided into nine 4×4 squares. Seeing SILL in one of the columns, cut the grid into three pieces along the two horizontal lines, such that the Y in row 5 was free to be aligned underneath to give the first ‘SILLY’. 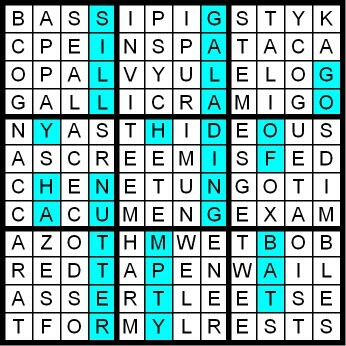 Align the pieces so that the five other ‘sillies’ run down columns: HATTER, NUMPTY, GALAH, DINGBAT and GOOF to give six in total, as specified by the numeration in the false clue. Stick the three peices together and highlight the six theme words. Sit back and think what a simple and straightforward puzzle it had been. It vaguely agrees with the way that I did it, although some of the steps explained above in just a few words took a considerable time. Luckily, I don’t have to put times against each step … that could be embarrassing! All that remains is for me to say thanks to Ron for a thoroughly enjoyable puzzle and look forward to another outing from him soon.